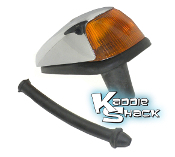 If your goal is to have the very best fit and quality when replacing the headlight on your '66 and earlier bug, this is the part you want. It fits great, and is built to last. Fits left or right. Sold each. Headlight assembly, type 1 and 2, thru 66. Price is for one assembly. These stainless steel Porsche-style stone guards are the ultimate accessory for that vintage look. They install very easily on the '66 & earlier Bugs and look terrific. 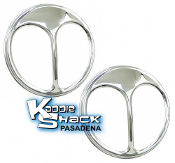 These stainless steel stone guards are a nifty accessory that add a unique look to any car. They fit Type 1 '67 & later, Type 2 '68 & later, and all Type 3. Sold in pairs. BRIGHTER THAN STOCK! 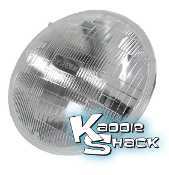 7" VW headlight conversion kit updates your headlight assembly with a modern H4 bulb. 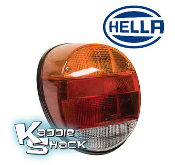 Comes with replaceable H4 Halogen bulb, available readily at any auto parts store. This is the traditional upgraded halogen 12V sealed beam type light bulb that replaced the original VW bulbs. It is brighter and less yellow than the original lights, but not as bright as the H4 conversions. An excellent choice for a factory replacement bulb. Headlight retaining assembly. This assembly fits: Bugs 67 and later, Bus 68 and later, Ghia 64 and later and all Type 3. Compatible with H4 headlight. Price is for one assembly. A simple and easy way to add a custom look to your VW! Replace your old rusty, bent up headlight rings with a pair of brand new ones. Price is per pair. If your headlight ring mounting screw is broken, stripped, rusted, etc, this is the correct part to replace it with. This little hard-to-find headlight adjuster screw is often in need of replacement due to being bent, rusted, stripped, or missing. Sold each. 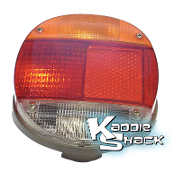 Replace that missing or damaged reflector. 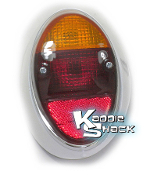 These aftermarket "snowflake" style taillights are a great reproduction of the OG VW lights on the early Bugs. 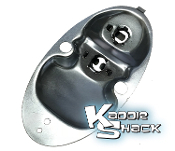 They come with metal housings, mounting gasket, and real glass lenses, just like the originals. 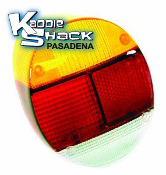 Is your taillight in your Bug faded, cracked, corroded, dented, rusty, not making good contact, or all of the above? Why not replace the entire unit? 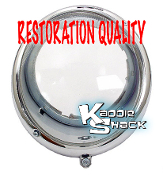 We have quality replacements readily available! When replacement is necessary for your Late Bug taillights, these Hella lights are the best quality you can get. 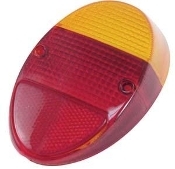 There is a noticeable difference between these lights and most of the aftermarket ones. They will fit left or right side. This chrome ring installs between the taillight and the housing. Sold each. Comes with the seal. 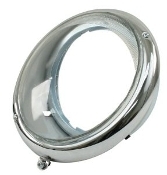 This chrome ring installs between the taillight and the housing. Sold each. 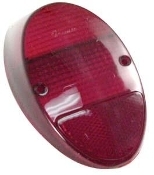 This special tail light screw is a tough one to find if you need one. They commonly strip or corrode and need to be replaced. This is a direct replacement that fits perfectly! 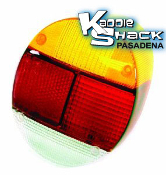 Spruce up your late model bug with this clear lens. Be sure to use an amber bulb inside. 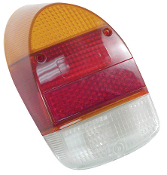 Quality front turn signal lens, fits either side. 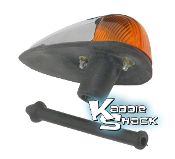 Are your turn signals not operating properly or cracked and corroded? It's not surprising. They've probably been on there for awhile! 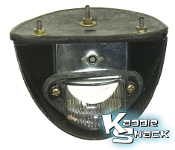 These replacements come with the lens, light housing, mounting gaskets, and the electrical sockets. 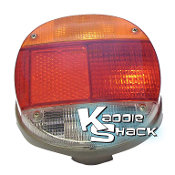 Front Turn Signal Assy, Right, Amber, '70 & Later Rear Licence Plate Light, '58 to '63 Bug, aka "Pope Nose"
The "Pope Nose", as this part is commonly referred to, is actually the license plate light assembly with the cover that fits on the deck lid on the early cars. It comes with the mounting gasket. 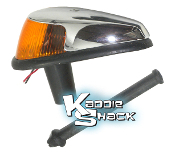 This is the replacement license light assembly for '64 & later Type 1 and all Type 3. 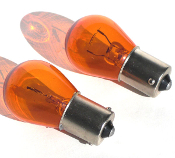 The bulb is sold seperately, as the early cars came with 6 volt, and later ones with 12V. 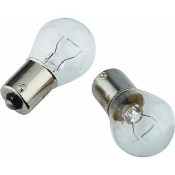 Replacement 10W interior bulb for your dome light, 12V. 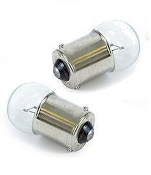 Replacement 10W interior bulb for your dome light, 6V. 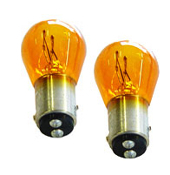 These are special amber colored bulbs, and work well with clear colored lights. 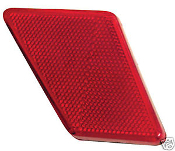 Dual filament bulbs are usually used in turn signals and brake lights. #1157 and #2057 are interchangeable. Check the bottom of your bulb for two contacts. Base is approximately 1/2" in diameter. 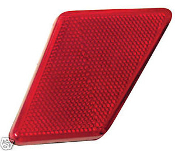 Dual filament bulbs are usually used in turn signals and brake lights. #1157 and #2057 are interchangeable. Check the bottom of your bulb for two contacts. Base is approximately 1/2" in diameter. 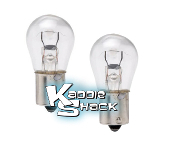 Single filament bulbs are usually used in running lights, turn signals, and reverse lights. Check the bottom of your bulb for a single contact. Same size overall as the 1157 bulb. 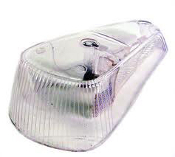 Single filament bulbs are often used as running lights or license plate lights. Check the bottom of the bulb you need for one contact. Base is approximately 1/2" in diameter. Single filament bulbs are usually used in running lights and turn signals. These have the same bse size as the #1141, but have smaller globe. They are also not as bright as the 1141. Check the bottom of your bulb for a single contact. Single filament bulbs are usually used in running lights and turn signals. Check the bottom of your bulb for a single contact. Base is approximately 1/2" in diameter. Single filament bulbs are usually used in running lights and license lights. Base is approximately 5/16" in diameter. 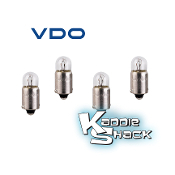 These quality replacement bulbs are made by VDO to replace your instrument lights when they burn out. 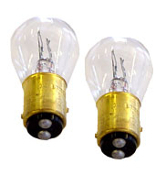 They fit "peanut style bulbs" and are used in VDO gauges using bulb #600809, and possibly some others. 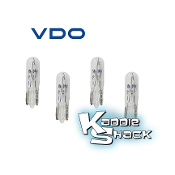 VDO "Peanut Style" Replacement Dash Bulbs, 4-Pack VDO Replacement Stock Dash and Gauge Bulbs, 4-Pack 9/32"
These quality replacement bulbs are made by VDO to replace your instrument lights when they burn out. They are used in stock VW dash gauges. They measure approximately 9/32" in diameter a little longer than 13/16" long overall. Fits socket# 600816. 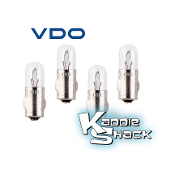 These quality replacement bulbs are made by VDO to replace your instrument lights when they burn out. 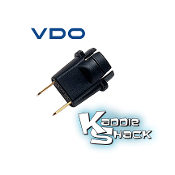 They are used in stock VW dash gauges, as well as some aftermaerket ones. They measure approximately 11/32" in diameter at the base. Fit socket #600819. 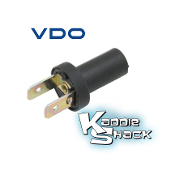 This quality replacement bulb socket is made by VDO. 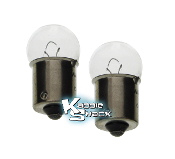 They fit stock and aftermarket VDO gauges using the 11/32" diameter bulb #600804, and possibly some others.